Steven (Chicagoland, United States) on 20 March 2015 in Plant & Nature and Portfolio. Garfield Park Conservatory’s 2015 Spring Show, “Sun Showers,” opened on February 14, 2015. Continuing the Conservatory’s grand reopening year theme, Sun Showers celebrates the revival of the Show House and its seasonal shows following the terrible hail storm from June 30, 2011 which left much of the Conservatory severely damaged with so many panes of glass shattered. 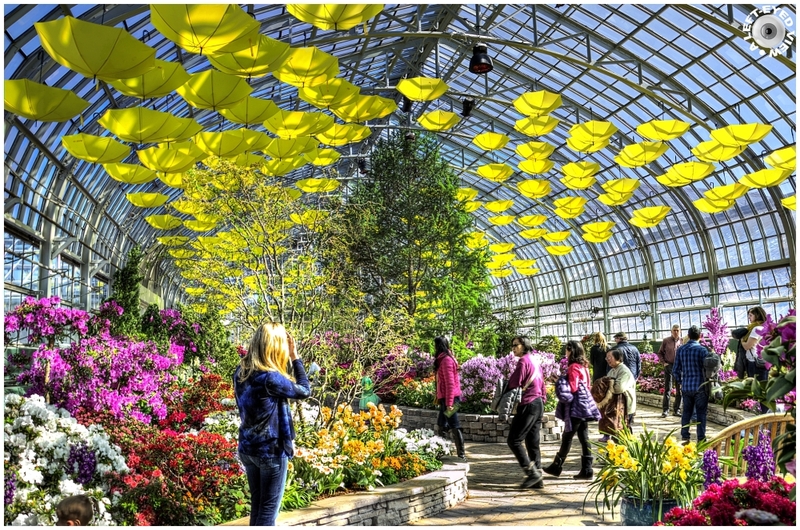 More than 200 yellow umbrellas hang from the glass ceiling, celebrating both the rain and sun that bring us hopeful spring flowers. Photo captured March 7, 2015. Rien n'est plus beau que toutes ces fleurs colorées. Beautiful composition and wonderfful colors ! Stunning shot and a wonderful way to revive the Conservatory's fortunes. A beautiful capture with marvelous color combinations ! WOW!!! Another shot of this wonderful show! I really love it! The idea with the yellow umbrellas is tops! very good overview, great light and colours ! A pat on the back for whoever thought up the idea of yellow umbrellas hanging from the beams.... a novel idea!! I love the brightness of the photo, the colors, beautiful flowers.... it all makes for a delightful visual! What a great community feature that the public can enjoy. A beautiful image of the conservatory. Ohhh It is fantastic !!! Great shot ! @Jean-Louis Guianvarc'h: Ah yes! I remember your series of photos with the pink umbrellas. such beautiful composition, colors, lighting & shadows! Very beautiful ... love the fresh floral colors and the umbrellas add such a neat touch! Beautiful photo! That is terrific. Especially with those umbrellas. That is amazing that the hail caused so much damage. I am glad that it is all repaired. This is such a gorgeous place. I love those umbrellas hanging from the ceiling. The flowers are spectacular! What a beautiful, sunlight space. Your processing really makes this image pop. Very good overview and great colors ! I like yellow umbrellas! Wonderful visual with all these fantastic colors and details. Ohh yeah... this is Springtime... beautiful photo, Steven! At least it is Spring somewhere. Lovely. Yellow umbrellas complement the magnificent colors of flowers creating a fascinating ambience ... Stunning image Steven !!! Wonderful , Like it .